Here is a quick idea for Fathers Day. Aren’t they fun? Here is a tutorial on how to make them. We’re celebrating fathers day on every third sunday of June to honor the hardworking fathers around the world. That’s why father’s day breakfast is one of the best to offer on our father. A special meal treat to the father comes from their wife can relieve all the the pain in terms of emotional that fathers undergo will easyly wiped out. You may check out this great video on YouTube for making a steak & eggs breakfast for your father. http://www.youtube.com/watch?v=XGoi9pMjzoA hope you’ll enjoy it. I should have the girls help me make this– it would be easy enough for them, but still super cute! Super cute and so simple. This is a great project when working with a group to make multiple gifts. so creative!!! I LOVE them! These are great! We are having the kids make these in Primary today for their dads! Thank you so much for sharing. Love your blog and am now your newest follower! I am having a problem printing out the tie template. It turns out HUGE. Can you tell me what I’m doing wrong because there’s no way this tie will fit on my envelope? This is adorable. Thanks so much! Going to do this with my after school summer program. So simple and cute. Beautiful idea!! I’ll be your follower! Thank you!! Love this idea. I’m going to be doing this. What a cute idea. Saw it on Then She Made. You guys are creative!!! This is a really cute idea and one my great granddaughters (4 under 6) can make thrie dad. Thank you. 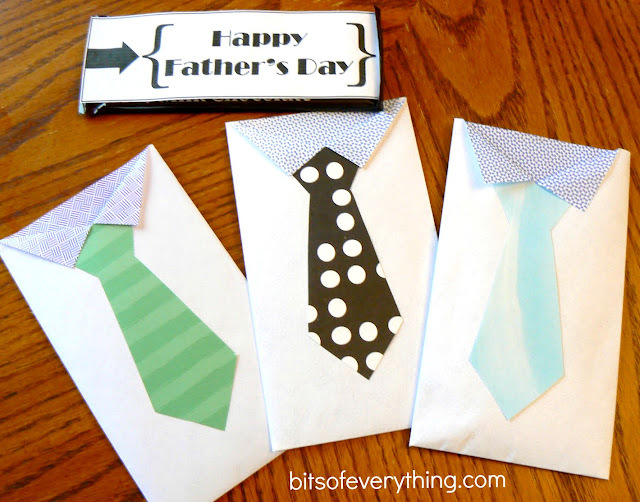 I used this tutorial and printable for Father’s Day cards this year. Come check it out. They were a hit! Thank YOU! I made these for the men in my church too. So stinkin’ cute! Thank you so much for sharing your talents and ideas! I printed out the tie pattern and note that you made. It came out way too big. Is there a way to make it smaller? When you push print and a box of options come up, you should be able to choose to scale the image down to the size you need. You could also look for an option to ‘fit to page’. Hope this helps. I know this is a silly question but did you use a regular size candy bar or king size? I chose the “fit to page” option on my printer but it still seems larger than a regular size so I wanted to check before I re-sized it! I love this idea and used it for my little girl! Thank you! You will find here the way to come from me to you!!! the whole thing iss existing on net? Followed you from “LIfe’s Journey to Perfection,” to “Then She Made…” to here! very cute and easy for most Primary kids to make, too!!! I think we may do this for our Primary Dad’s. Thanks! Where can I find envelopes with the blue inside? Help I’ve looked everywhere! and also with the formaat for your blog. Is that this a paid subject matter or did you mpdify it your self?